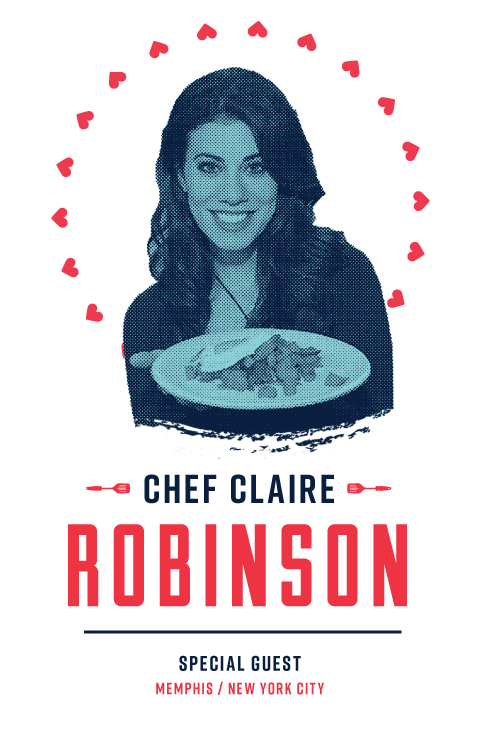 Claire Robinson is a chef and television personality best known for her Food Network show 5 Ingredient Fix, combining her devotion for food and teaching in a series featuring delicious eclectic recipes made with five ingredients or fewer. A graduate of both University of Memphis and the French Culinary Institute, Claire believes the best dishes feature a carefully selected few ingredients, a straightforward cooking style that also promotes healthier and seasonal eating. In 2010 Claire released her first cookbook, 5 Ingredient Fix: Easy, Elegant and Irresistible Recipes. As a host, Robinson brings culinary knowledge and a fun passionate curiosity. By providing minute-by-minute details as host of series such as Food Network’s Challenge, and BBC America’s Chef Race, Claire held the excitement for show fans. With Robinson’s widespread and dedicated audience, she thoroughly enjoyed being the chef most selected for numerous appearances in Food Network’s Best Thing I Ever Ate. Claire’s passion for food is equal to her adventurous side, enjoying extensive travel and a variety of unique sports including sky and sea diving, boxing, deep sea fishing and slalom waterskiing. A Tennessee native, Claire Robinson lives in New York City and continues to drive the restaurant and food industry using her knowledge and experience not only within the country’s largest city, but nationally and internationally, with expansive demand.